Home program hacking knowledge Love is never cheap but how costly are sweetheart swindles? Love is never cheap but how costly are sweetheart swindles? Last week, as couples all over the world celebrated Valentine’s Day, we highlighted the risks of romance fraud. Even with V-Day safely behind us, it’s important to remain on high alert for online dating scams, as heartless crooks keep themselves busy wooing people on dating apps and sites and on social media throughout the year. Now, how many people fall for online fraud that’s rooted in faux romance and what’s the financial damage caused by bogus suitors? A few statistics will help illustrate the magnitude of the problem. In the United States alone, for example, more than 21,000 people reported losing a collective US$143 million to romance scam artists last year, reads a report by the US Federal Trade Commission (FTC). The median loss was US$2,600, which is seven times more than the corresponding figure across all other types of online consumer fraud. 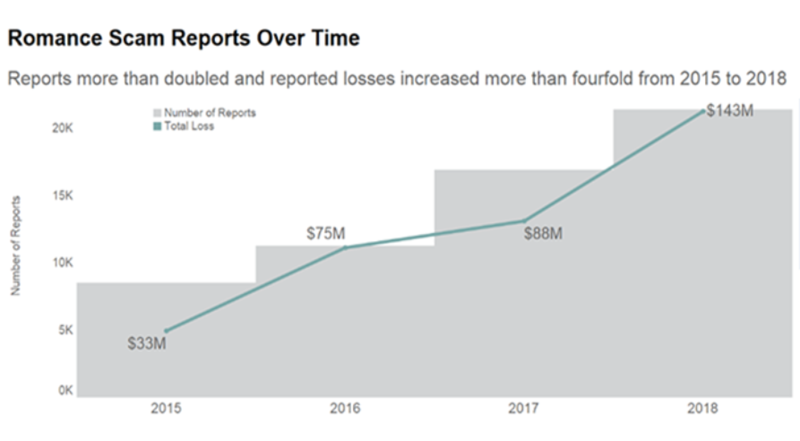 Things have been getting worse at a rapid clip, as the reported losses more than quadrupled between 2015 and 2018. This, too, helps show that romance scams are becoming an increasingly acute problem for people seeking love online. “People who said they were ages 40 to 69 reported losing money to romance scams at the highest rates – more than twice the rate of people in their 20s,” according to FTC. On the other hand, people aged 70 or higher were hit particularly hard – for median losses of US$10,000. Of course, the steady rise in financial damage isn’t limited to the US, with much the same pattern emerging when we examine figures reported elsewhere. In the United Kingdom, more than 4,500 people reported losing more than £50 million (US$66 million) in aggregate to romance scammers in 2018. The loss went up by nearly one quarter on the year. Meanwhile in Canada, the cumulative reported loss caused by romance scammers reached CAD$22.5 million (US$17 million) in 2018, having risen by almost 20 percent from 2017. And we could go on. Making things worse, the actual number of victims and the amount of damage are almost sure to be far higher, as many victims are too embarrassed to come forward. Here’s our advice for how to spot the signs of an online dating scam and how to date online safely may help.